On the 24th March I went to photograph the protest march for the Day of Memory for Truth and Justice. It is dedicated to the "desaparecidos", the 30,000 dissidents and people connected to them who were "disappeared" during the military dictatorship in Argentina between 1976-1983. 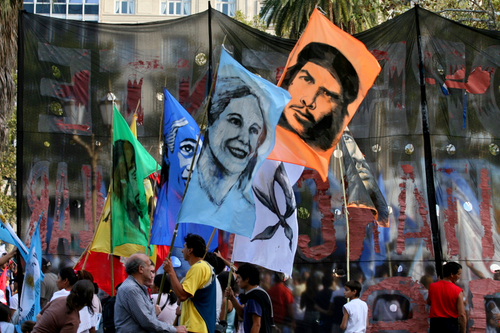 The central purpose of the demonstration was upheld with a sombre ceremony in the centre of the Plaza de Mayo, where the Mothers of the disappeared still march every Thursday. However, protest is commonplace in Argentina and there were plenty of other interests represented (what does Che have to do with it? 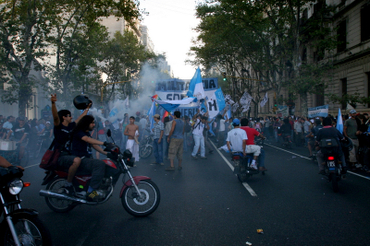 ok he was from Argentina), including the obligatory rent-a-crowd and Piqueteros, 'professional protestors' who receive their welfare benefits to add a pro-government voice to a demonstration. Here is another article about them.